An annual Remembrance Day service is held at the Cenataph in Whitehall, London in honour of the servicemen and women who died for their country. More than one million men and women from Britain and the Commonwealth died in World War I between 1914 and 1918, and nearly 500,000 in World War II from 1939 to 1945. The service has changed little since it was first introduced in 1921, hymns are sung, prayers are said and a two minute silence is observed. Official wreaths are laid on the steps of The Cenotaph. Her Majesty. the Queen lays the first wreath at the foot of the Cenotaph and bows, followed one by one, by other adult members of the immediate Royal Family, who bow if in civilian dress, or salute if in military uniform. 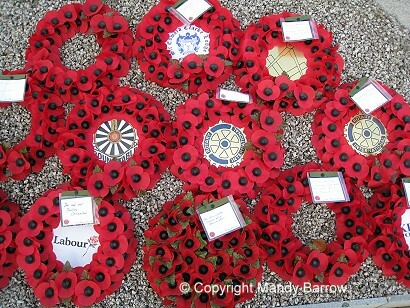 The next to lay their wreaths are The Prime Minister, the leader of the Opposition and leaders of other political parties. They are followed by other people laying wreaths. The ceremony ends with a march past of war veterans; a poignant gesture of respect for their fallen comrades. Literally meaning 'Empty Tomb' in Greek, The Cenotaph was designed by Edward Lutyens and was created from Portland stone, the inscription simply reads "The Glorious Dead". There are only two cenotaphs in Britain. There is the one in Whitehall, London and the other one is in Aberdare, Wales. 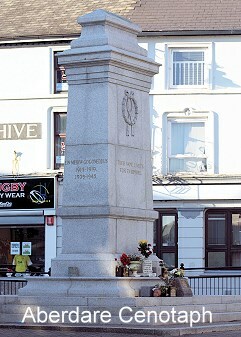 All other war monuments in Britain are war memorials. Service on the Saturday immediately before Remembrance Sunday. 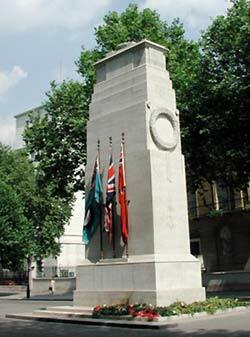 The service at the Cenotaph starts at 12.30pm and last approximately 1/2 an hour.